A methane ice cloud is seen over the north pole of Saturn's moon Titan in this view captured by NASA's Cassini spacecraft in December 2006. Scientists suspect that intense methane storms on Titan may also sculpt towering dunes at the moon's equator. Rare tropical methane storms could help solve the mystery of how strange, giant dunes form on Titan, Saturn's largest moon, researchers say. When NASA's Cassini spacecraft began exploring Titan in2004, its most dramatic discovery was the field of dunes that covers nearly 15 percent of Titan's surface along its equator. These dark, massive dunes — the largest of their kind in the solar system — are made of exotic sand composed of hydrogen and carbon. They can be more than 330 feet (100 meters) high and are typically 18 to 31 miles (30 to 50 kilometers) long. Now, researchers have found that rare methane storms could help sculpt the moon's surface. "Clouds and storms are rare on Titan," said Benjamin Charnay, a planetary scientist at the Dynamic Meteorology Laboratory in Paris and lead author of the study detailing the new findings. "They were not expected to have an impact on dunes." Sand dunes on Saturn's largest moon Titan dominate this image captured by NASA's Cassini spacecraft in 2009. This image is centered on a region just north of Titan's equator. Scientists suspect Titan's giant dunes at the equator may be sculpted by intense methane storms. Titan is the only moon in the solar system with a thick atmosphere. Its atmosphere is composed mostly of nitrogen, with a trace of methane that can form into clouds. During the equinox, when days and nights are about the same length, Titan experiences huge, violent methane storms in the tropical regions around its equator. 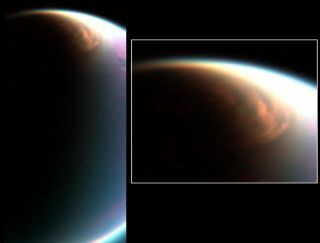 Computer models of weather on Titan revealed that methane clouds can reach altitudes of 15.5 miles (25 kilometers), where the high, fast eastward winds blow. The researchers found that, as a result, methane storms can produce downdrafts that flow eastward on strong gusts after they reach Titan's surface. The researchers estimated that these eastward gusts can reach up to 22 mph (36 km/h) — 10 times faster than the usual winds close to Titan's surface. "We were very surprised by the intensity of the storm gusts," Charnay said. "For Titan, it is like a hurricane." The researchers suggested that these storm gusts may explain the shape, size, spacing and eastward growth of Titan's dunes. If scientists can get a better understanding of how these dunes form on Titan, it could reveal more insight into the moon's present and past atmosphere. "There are long dunes on Titan which formed over a very long period of time, likely more than 1 million years," Charnay said. "Others are shorter and formed during the last 100,000 years." By studying Titan's dunes, scientists can also learn more about dune formation on Earth. For example, in this new study, the researchers developed a new growth mechanism for dunes that may answer questions about how dunes form on Earth, Charnay said. The scientists detailed their findings online April 13 in the journal Nature Geoscience.